Women in science, technology and innovation: old stereotypes and new realities | The Forum Network, hosted by the OECD: Shape ideas. Shape policy. Shape the Future. The OECD's 2017 Science, Technology and Industry Scoreboard brings fresh evidence on where women stand in the pursuit of better representation in the world of science and technology. Gender stereotypes in science, technology and innovation fields are nothing new and remain particularly hard to shift, as the controversies in Silicon Valley earlier this year confirm. Yet efforts to address these stereotypes are more pertinent than ever as the digital transformation rapidly increases the demand for ICT skills - amongst others - and creates opportunities for ICT-intensive jobs, which often pay higher wages. A great opportunity: but what are the odds of women actually seizing it? The OECD's 2017 Science, Technology and Industry Scoreboard brings fresh evidence on where women stand in the pursuit of better representation in the world of science and technology. Already, PISA results tell us that 15-year old boys tend to outperform girls in maths and science tests, and it's not hard to imagine that this might shape early biases in perceptions of ability that influence fields of study and subsequent career paths. And indeed, women are still significantly less likely to choose natural sciences, engineering, and ICT studies. In 2015, 23% of all students graduating at tertiary level within OECD countries did so with a degree in these fields. Almost 70% of them were men! Men also accounted for for almost 60% of all doctorate holders in OECD countries in 2015 and for around 77% of all researchers in Germany and Austria, for instance. Does a "glass ceiling" still prevent women being represented in senior decision-making positions? Refreshingly, the winds of change might be blowing from the direction of emerging economies: with more than 260 000 female tertiary ICT graduates in 2015, India is the country closest to gender parity in this field, followed by Indonesia. Further encouraging evidence comes from smaller economies: Latvia has achieved gender parity in the number of researchers (over all disciplines) and in Luxembourg the creation of the country’s first public research university in 2003 helped to stimulate a 10 percentage point increase in the share of women in the researcher community within a decade. Nevertheless, does a "glass ceiling" still prevent women being represented in senior decision-making positions in scientific occupations? Experimental indicators show that today only 21% of scientists who are identified as “corresponding authors” - a proxy term for leadership in the world of research - are women, while an astonishing 86% of remunerated editorial board members of scientific journals are male (fig 1). Yet the development of new technologies may no longer be considered a “man’s world”, if it ever really was. Women have invented everything from windshield wipers (Mary Anderson received the patent in 1903), to life-saving Kevlar (thanks to chemist Stephanie Kwolek) and the programming language COBOL (with Grace Hopper introducing the idea that computer programs should be written in a language close to English). One way to investigate the contributions of women to innovation is to look at the proportion of patents featuring women inventors. 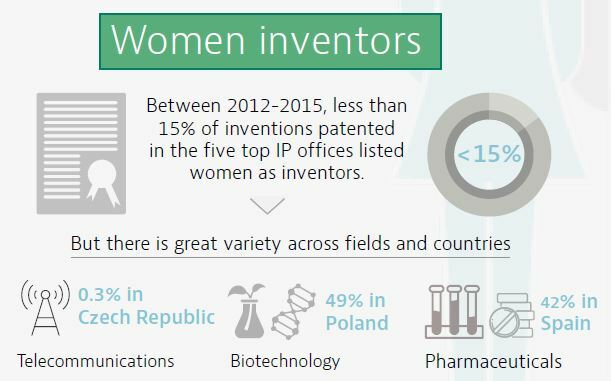 Here, while it varies across countries (between 2012-15, we see figures ranging from about 4% in Austria, to 7% in Japan, 10% in the United States and over 15% in Portugal), we already see sizeable contributions in certain technology fields (women inventors feature in 42% of patented inventions in pharmaceuticals in Spain, and 49% of biotechnology patents in Poland) (fig 2). While narrowing, however, a gap in wages persists: even after individual and job-related characteristics are taken into consideration, women earn 4 to 29% less than men (in a sample including most OECD countries). 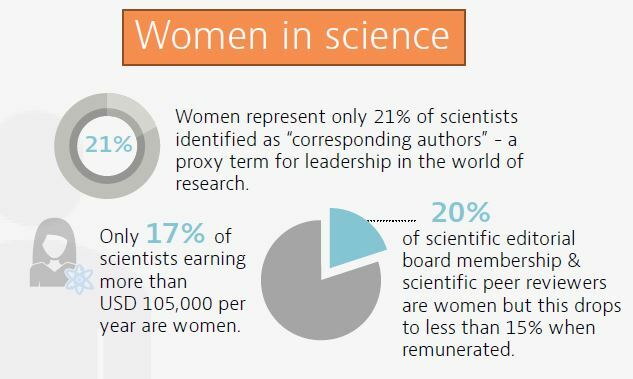 And the scientific community is not an exception: only 17% of those scientists earning more than 105 000 USD are women. However, our analysis shows that when women undertake more ICT-intensive tasks in their job, the related pay increase is higher for them than it is for men in almost all countries (the premium is up to 3% in the Russian Federation, 2% in Ireland and above 1.5% in Korea, Turkey, Italy and Greece, for instance) (fig 3). Perhaps here the digital transformation will help us get real traction towards achieving gender equality. To this end, ensuring that women are well equipped to undertake more technical tasks may help put them on the path to higher salaries. In short, closing the gender gap in science and innovation is not out of reach and we are getting incrementally closer, albeit at an agonisingly slow pace. We need to move the debate forward and accelerate progress. Now is the time to take advantage of the digital transformation to ensure that it represents a leapfrog opportunity for women. Measuring how far we've come is part of the story, and the OECD will keep on with this agenda to help societies and economies reap the full benefits of #goingdigital. Andrew W. Wyckoff is the Director of the OECD’s Directorate for Science, Technology and Innovation (STI) where he oversees OECD’s work on innovation, business dynamics, science and technology, information and communication technology policy as well as the statistical work associated with each of these areas. Mr. Wyckoff was previously Head of the Information, Computer and Communications Policy (ICCP) division at the OECD which supports the organisation’s work on information society as well as consumer policy issues. Raffaella Centurelli works as an advisor in the OECD’s Directorate for Science, Technology and Innovation (STI), to help advance strategic priorities and engagement with key global governance fora, including the G7 and G20. Ms Centurelli was previously advisor in the OECD Sherpa Office and Global Governance Unit, and, prior to that, she worked as an energy analyst in the Office of the Chief Economist at the International Energy Agency. She holds Master Degrees in energy economics and in theoretical physics.